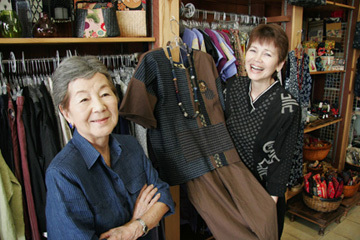 Nui Mono owners Elaine Costello, left, and Lue Zimmelman, holding one of their designs, in their shop. Location, location, location. The real-estate mantra. In an age where folks move every few years, there's something comforting about a business that stays put. Highlights: Craft fair, taiko and Okinawan drumming, Royal Hawaiian Band, hula and Vietnamese dance, lion dances, ethnic food, storytelling, historical photo exhibit and newly designed "Discover Moiliili" T-shirts by Grant Kagemoto. Climbing out of the heart of Moiliili, on the rise into Kaimuki, Nui Mono Hawaii is tucked into a little storefront on King Street. It's a mom-and-daughter operation, in business for more than two dozen years. Elaine Costello and daughter Lue Zimmelman run a kind of boutique "clothing and gift shop with an ethnic flair," as Costello puts it. Before that, the shop housed her late husband's electrical business. "He let me have a corner of the electrical shop for my clothing line!" laughs Costello. "I've always been doing something." Costello, Zimmelman and Nui Mono are the type Moiliili stalwarts whose contributions to the neighborhood are celebrated at the annual Discover Moiliili Festival. The 10th anniversary event is Saturday. Costello will contribute jars of her sengiri daikon and sanbaizuke to the General Store; both women contributed recipes to the benefit cookbook that will be sold at the festival. Nui Mono -- the name sort of translates into "sewing thing" -- is known for stylish yet comfortable casualwear, generally made of rich fabrics and colors from Asia. "I've always enjoyed nice clothes, so I had to make my own," said Costello, who began by recycling old kimono and obi fabrics. "Whew! A lot of work, that," said Costello. "So we decided to use new fabrics, and needed the shop space." 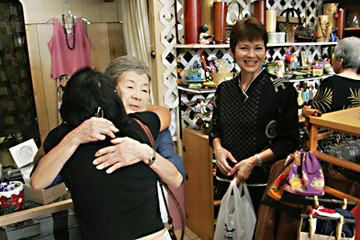 Nui Mono owners Elaine Costello, left, and Lue Zimmelman welcomes Costello's niece, Kelly Mitsuyasu, to their shop. Costello and Zimmelman do the designing and much of the cutting, while the actual sewing is farmed out. "Folks working at home," said Costello. "That's why they call it a cottage industry." Costello picked up her flair from mother Tetsuko Endo, who moved to Hawaii to work as a nurse. "But she was a poet, really," said Zimmelman. "A good writer and a master of ikebana," added Costello. "She particularly liked design and color." Zimmelman dabbled in other careers in the 1980s, including writing mystery thrillers, but came home, literally, when the family electronics shop morphed into the boutique. "My favorite memories of childhood are sitting with my mom paging through pattern books -- for a little girl, they're dream books -- and eventually we'd pick one, if I was good." Costello was sent to sewing school in her teens; Zimmelman tried a sewing class in summer school at age 10. "I hated the structure and loved the sewing!" Thanks to loyal customers and word of mouth, Nui Mono "does fine," said Costello. So much so that they had to shut down on Mondays just to get the week's errands done. Keeping it in the family, sibling Steven does the accounting and also designed the Discover Moiliili Festival newsletter. "He's good with computers," said Zimmelman, with an expression that seemed to equate computing with black magic. "This is my kind of job," said Costello, waving at the shop. "Creating things, and it's not labor intensive. I'll keep it up as long as my health holds out." "The customers make us promise not to retire," said Zimmelman. "But when Mom retires, I'll retire. My husband is in the wholesale business, and he's very good at it. No kids to take over. Unless Lilikoi wants to take over the business." "My poodle! Lilikoi is one smart puppy, but I'm not sure she can sew."